We understand that we must be responsible to society for the social and environmental impact. We developed and adopted policies describing the mechanisms of labor protection, minimizing the impact on the environment, efficient use of materials and resources, caring for employees and their families. Without due attention to these issues the further sustainable business development is impossible. We seek to gain the trust of our customers, employees, and partners and contribute to the development of the modern society. 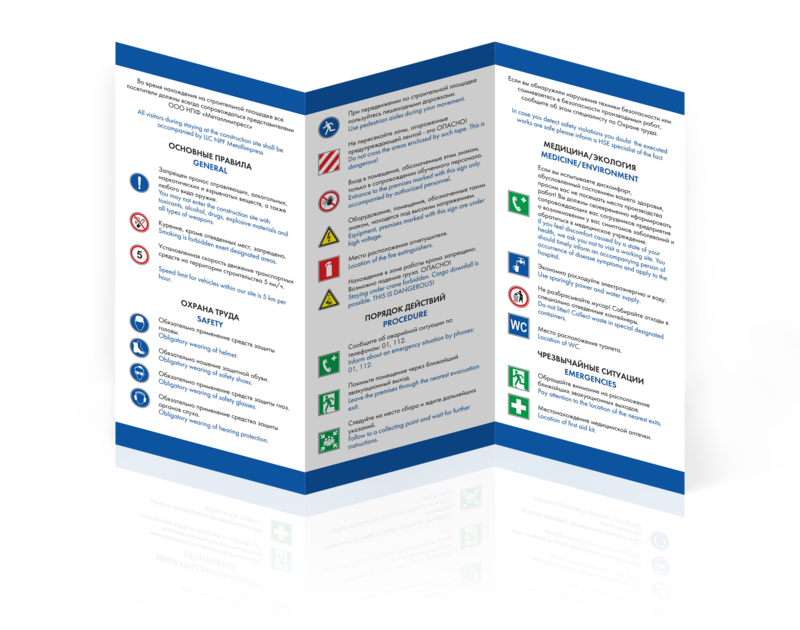 - HSE system interconnection with management decision making. - monitoring, reporting and execution control. done efficient use of energy sources. For each object we issue special HSE brochures for visitors. Hereby I would like to thank the Occupational Safety and Health Department of the Metallimpress Company for a responsible approach to work, rapid response to customer requests, professionalism and overall contribution to the improvement of work culture and performed work on the construction site of LLC Armstrong Building Products. 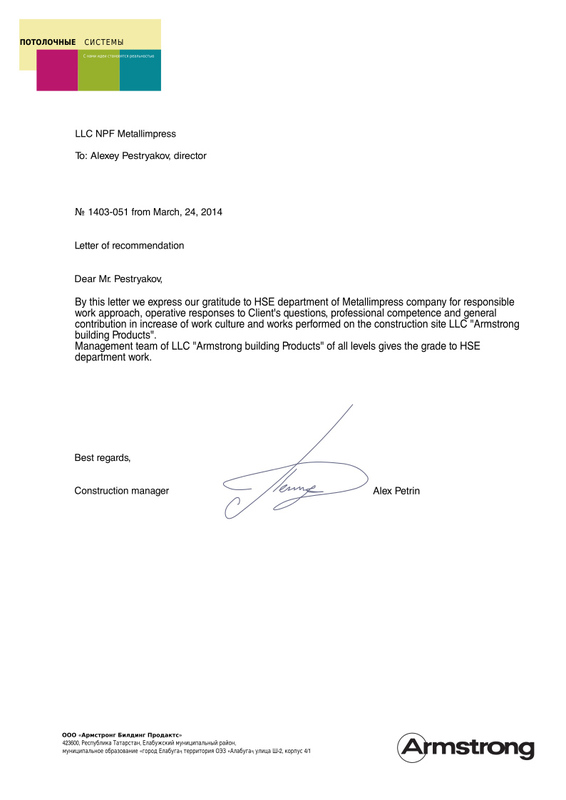 The work of the OSH Department of LLC Metallimpress is appreciated by the management of the LLC Armstrong Building Products at all levels. 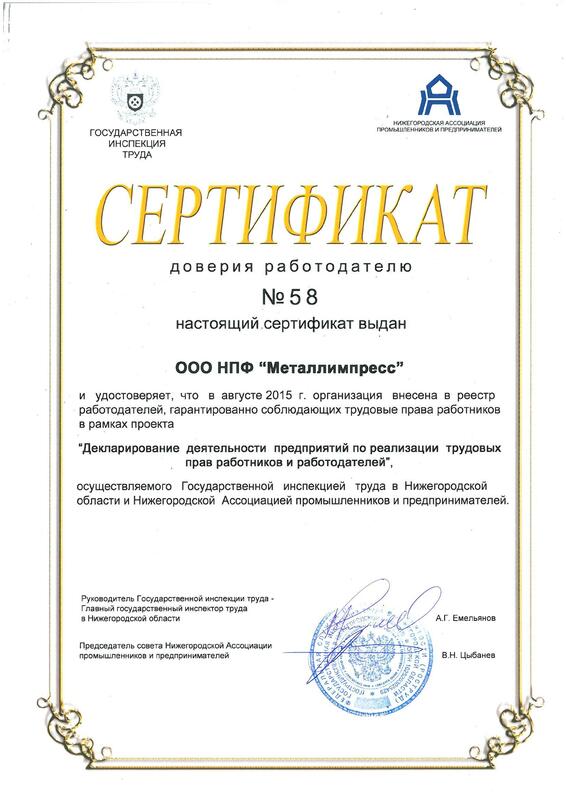 This Сertificate is issued to LLC NPF Metallimpress and certifies that in August 2015, the Company was listed in the register of employers, guaranteed respecting the rights of workers within the Project “Declaration of activities the enterprises to implement the labor rights of employees and employers” conducted by the State Labor Inspectorate in Nizhny Novgorod region and Nizhny Novgorod Association of Industrialists and Entrepreneurs.